The importance of woodpiles and survival in Maine cannot be underestimated when it comes to living through sub-zero weather. 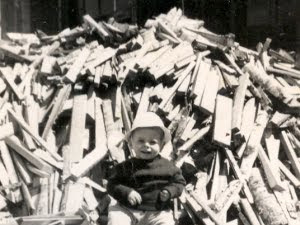 The photo of the infant on a woodpile here is yours truly a few years back circa 1950. Okay, so a lot of years back… when I was actually cute and didn’t have to shave. To this day I still love the smell of burning wood in an old fashioned cast iron wood stove. In the 1950’s you never had to ask if someone in Derby, Maine, had a woodpile to help get through the winter. It was a matter of how big. Bigger families in bigger homes may have had more than one stove, and their woodpile was more like a mountain. You were likely too late if you waited to gather wood after the first blizzard of the season. Even in freezing weather you could harvest frozen logs easier than trees buried in snow. Nowadays harvesting wood for a wood stove is easier than ever what with chain saws becoming common and more affordable. We didn’t have the luxury of a chain saw. Cutting logs to length was done with a bucksaw or two-man crosscut saw. We owned both, but when old enough to help, I preferred the crosscut. The blade was about 5 feet long with wooden handles at each end. The teeth were bigger than a bucksaw. The sawing motion involved a person on each end pulling on the saw handle. You pulled while the other person held on. As you completed your stroke, they pulled in the opposite direction back towards them. While one was pulling the other released pressure and gently held the handle. Besides being fun, you pulled every other stroke so it was half the work. Logs cut to length to fit in the stove still needed work. Splitting logs into practical size was next. Youngsters today have learned the importance of grip on video game controllers, and may never learn the satisfaction of breaking a sweat over a saw or ax. When I was old enough to drive, gasoline was 25 cents a gallon. Fuel oil for heating in Maine was still very reasonable, too. As time went on, bucksaws and crosscut saws became antiques, yet wood stoves are as popular today as way back when. Chainsaws may have made the old saws obsolete, yet wood stoves and woodpiles in Maine are almost as common today and still being enjoyed just like in the good old days. Driving through small towns, and especially as fall approaches, you can still see evidence of the importance of woodpiles and survival in Maine.